Item #0646: In order for your bones to be healthy, strong and vital throughout your life, they require so much more than run-of-the-mill calcium. This is why our Bone Renewal formula not only includes the highest quality plant-based calcium, but it combines three classes of highly researched, bio-organic ingredients to provide the most comprehensive, holistic solution for maintaining healthy bones and mineral storehousing for the many organs and systems that your bones support. Each of our 13 nutrients is hand-selected from sustainable, water and land-based sources to powerfully capture nature's inherent nourishment, energy, and bone restorative powers. Our easy to take formula for Bone Renewal includes the optimum amount of each ingredient as established through clinical research. We never skimp on the serving size or quality needed for genuine, healthy bone support. 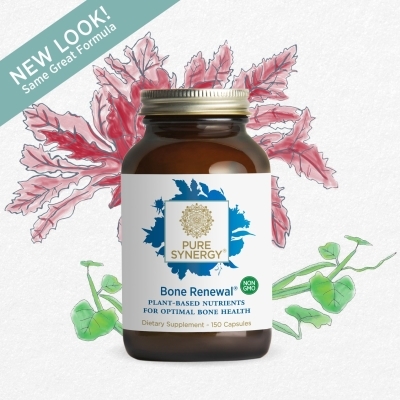 Bones need whole-food nutrients  not "rocks"
Bone Renewal's Bio-Organic plant-based ingredients are better absorbed. Bone Renewal is uniquely designed to support natural bone health and growth. Bone Renewal's blend of ingredients nourishes your body's vital processes. Bone Renewal contains a highly researched blend of exclusive botanical Synergizers®. Bone Renewal supports all the seasons of your life.